Readers who were children in the 70s or 80s, (or frequenters of Wimbledon Common) may have heard of the Wombles. They were a fictional group of furry rodent like creatures who collected old rubbish and recycled and reused it in creative ways. In many ways ahead of their times before recycling was trendy, but still a group of fictional rodents. Then there is me at work. Fortunately my office is a bit of an upgrade to the Wombles’ clutter filled burrow; I have a fancy chair, a desk that goes up and down, a laptop with a docking station, two big LCD monitors, not to mention lots of lovely colleagues. 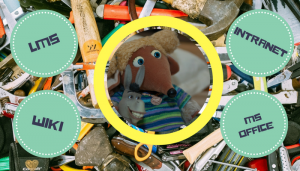 Certainly nothing to complain about, but when it comes to IT systems and systems for delivering learning, well that’s when the clutter of the Wombles becomes more of a comparison. Like many companies we have a hotchpotch of systems available to us, they’ve evolved over time as strategies have changed, budgets have expanded and contracted (and contracted and contracted). Some have become foundation stones of our daily work, others float around behind the scenes doing things few understand but that everyone else is scared to mess with! I don’t think we’re unusual, I don’t think we’re deprived either, but in the world of learning that I work with, technology can be a great enabler. I’m trying to change the way our people and managers see learning, away from classes and courses to support processes and reference resources. There are many great pieces of software to support and enable this shift, but for those of you who, like me, haven’t got the budgets right now, for the shiniest new kit, it’s important to remember that while we dream, there is still plenty we can do. Like the wombles we can achieve a lot by recycling and reusing our existing software in different ways, often in ways it wasn’t built for. Some of these things are dead easy to do and there is no better place than building a revolution than from the bottom up, show the people what they can do and let them fly.